Written communications are a vital part of ecommerce marketing. How a business presents itself in words may affect how that business is perceived. With this in mind, it is a good idea for entrepreneurs and marketers to use a writing style guide. Style guides aggregate a set of standards for punctuation, grammar, citation, spelling, and word choice. These documents may be specific to an industry, an organization, a subculture, or even a particular business. In all cases, the style guide’s purpose is to facilitate concise written communications that convey the author’s intentions. Style, spelling, and grammar are the building blocks of much of the digital world’s content. They are used together to construct page content, paragraphs, sentences, and even words. But, too often their value is diminished by bloggers and twits — people who tweet on Twitter — who believe that punctuation and even spelling don’t matter. This is, however, a grave mistake, since errors in grammar, spelling, and style do have an effect on meaning and perception. Consider this spelling error found in the page title on a VIM cheat sheet for the VIM code editor. This page, which contains specific keyboard shortcuts for using the VIM tool, was shared on Google+ and Facebook. In all cases, the spelling error in the page’s title tag was transferred to these social networks, where it will remain. The same example also has a punctuation error. Notice the comma immediately followed by a semicolon. While these errors do not necessarily take away from the excellent work this author has done, it does make one worry about what other aspects of the work, such as the cheat-sheet content, may also contain errors. 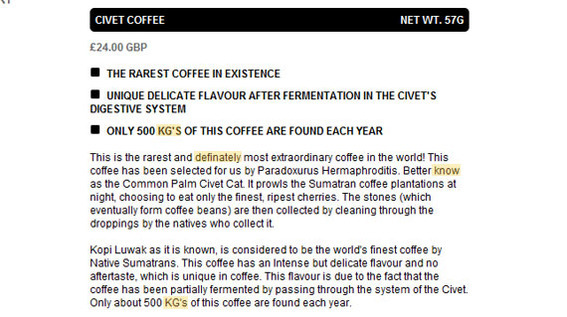 Below is a product description from an online purveyor of exotic foods. The sample contains both spelling and punctuation errors. There is also at least one spot in the description where an improvement in style may also improve readability. However minor these errors may seem, many thoughtful readers will notice them. The first spelling error is in the opening sentence: “definately” should be “definitely.” The second spelling error is in the sentence “Better know as the Common… .” The word should be “known.” The punctuation error is in “KG’s,” which should be “KGs.” The apostrophe makes the term possessive, meaning that something belongs to the kilograms. The new version of the sentence has five fewer words — even with the addition of the term “Sumatran” — and better communicates. While these errors may seem minor, many, if not most, thoughtful readers would notice the mistakes. Any excuse to eat marshmallow’s is a great day. – Is there a proper technique to toasting a marshmallow? – Is a marshmallow better or worse with flecks of campfire ash stuck on one side? – When making a S’more, how do you stack it? – Have you seen the new HUGE marshmallow’s? Discuss. Thanks for answering some of these age old questions for us. Although someone’s perfect marshmallow is different than the next person’s, I think we can all agree that they are a childhood memory that we are thrilled to share with our own sticky children. To avoid similar mistakes, marketers are wise to choose a writing style guide to use for all customer-facing written communications. Writers should become familiar with the style guide and begin to refer to it whenever a question about grammar or style arises. Here are several excellent writing style guide choices. Regardless of which style guide a business choose as a primary manual, The Elements of Style must also be used. It is foundational to good, professional writing. Purchase the fourth edition for about $10. 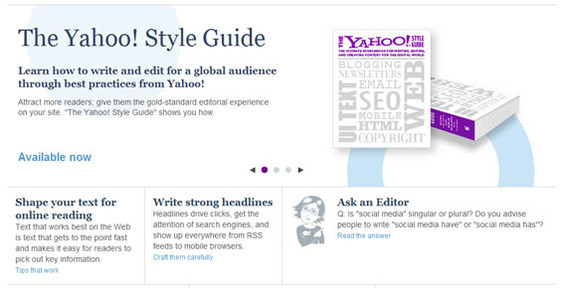 Written for digital publications, The Yahoo! Style Guide is a good choice for ecommerce marketers since the book also includes instructions specific to successful online writing. For example, this style guide has suggestions for improving headlines, which are, in some ways, similar to writing product titles. Expect to pay about $15 for this manual. The Yahoo! Style Guide is a good choice for ecommerce businesses. The Associated Press Stylebook is the leading style manual for journalism and blogging. If a site has a blog, it should probably be using this text. In fact, Practical eCommerce uses the AP Stylebook. The text will cost about $19.95 in printed form. There is also an excellent web version that is available for a $25 annual subscription. Even in the digital age, The New York Times is a leading news source with a vast following. The New York Times Manual of Style and Usage represents the “house rules” for this venerable publication. The manual is a solid choice for blogs, papers, or articles. The manual costs about $15. The Chicago Manual of Style is in its 16th edition. This excellent resource has been widely used in the United States since 1906. It may be the best available style guide for Internet businesses. The manual is also available as an online subscription, for $35 per year. 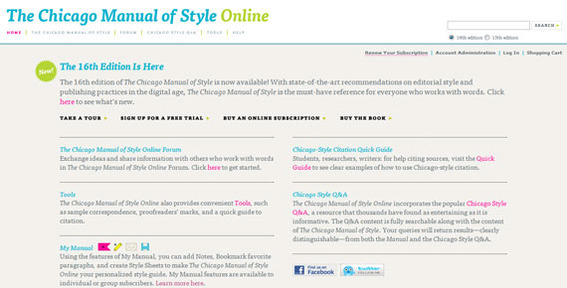 The Chicago Manual of Style may be the best choice for general online businesses. Aimed at technophiles, the Wired Style manual, which was first published in 1999, aims to describe the “principles of English usage in the digital age.” The text is a good choice for marketers that aim to reach technical and data-oriented customers. The hardcopy is available for about $5. Whenever a writer or publication endeavors to post an article about writing and grammar, that writer or publication invites, to a certain extent, scrutiny. The important thing is that writers, whether writing articles for a journal or product descriptions for an online store, aim to be accurate and grammatically and stylistically correct. Remember, errors, however minor, reflect poorly on a business. 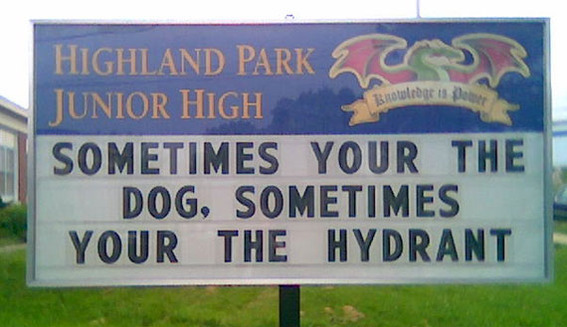 Here a school makes a common error: “your” instead of “you’re.” Thanks to Steve Dinn for this Creative Commons image.